A large sulfur dioxide plume and several thermal anomalies from Manda Hararo that were detected in satellite imagery during 28-30 June prompted a science team to visit the area on 4 July. After conducting ground-based and aerial observations for approximately 2 hours, they reported that the eruption occurred near the August 2007 eruption site, and was possibly bigger than that event. No active lava effusion was seen, but steaming was observed from the 4-5 km-long fissure that, because of high temperatures, had to be observed from a distance. They also saw new predominantly 'a'a lava flows that were 2-3 m thick. The fissure was lined with scoria ramparts 30-50 m high. Temperature measurements taken with a FLIR (Forward Looking Infrared Radiometer) indicated that the lava flow had cooled significantly with temperatures between 30 and 120 degrees Celsius at the surface. A maximum temperature of 238 degrees Celsius was measured during aerial observations. A large SO2 cloud in southern Afar, Ethiopia was detected by the OMI instrument aboard NASA's EOS-AURA satellite on 29 June 2009 (figure 28). The cloud appeared to originate from the Karbahi region of the Manda Hararo rift segment, a graben area with numerous active faults, fissures, and basalt flows. The cloud was similar in size to that observed during a basaltic fissure eruption in August 2007 (BGVN 32:07). As reported by Simon Carn, the 29 June 2009 cloud had a total mass of 3.864 kt, an area of 186,710 km2, and an SO2 max of 4.75 DU (Dobson Units). Other clouds were also seen, including a large one on 30 June. Figure 28. The eruptive SO2 cloud from Manda hararo over southern Afar region detected by the OMI instrument. Image acquired during 1021-1203 UTC on 29 June 2009. Courtesy of Simon Carn, Michigan Technological University. MODIS satellite imagery from 2320 UTC on 28-29 June confirmed that the SO2 cloud was associated with thermal anomalies appearing in the immediate vicinity of the August 2007 eruption. According to Charles Holliday, METEOSAT real time Active Fire Monitoring data derived from METEOSAT imagery suggests the eruption began within 15 minutes of 1715 UTC on 28 June 2009, about 7 hours after a magnitude 4.4 earthquake, identified by the Addis Ababa Geophysical Observatory and the European-Mediterranean Seismological Centre. 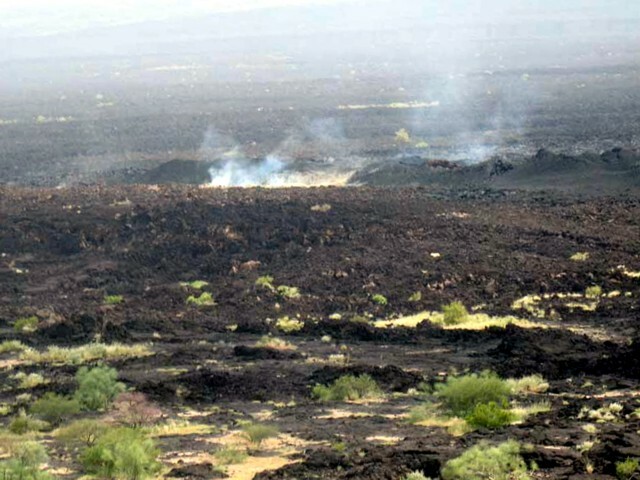 A field team of scientists, including Gezahegn Yirgu, Tesfaye Kidane, Elias Lewi, Tesfaye Chernet, Girma Wolde Tinsae, David Ferguson, Talfan Barnie, and Osman Mohammed, reached the site of the thermal anomalies by helicopter on 4 July 2009 and spent about two hours on the scene. They found the eruption had emitted predominantly a'a basalt flows, approximately 2-3 m thick that originated from fissures approximately 4-5 km long. The vent areas contained scoria ramparts approximately 30-50 m high. The field team collected rock and gas samples and surveyed the erupted material using visible and FLIR (Forward-Looking Infrared) cameras from both the air and the ground. Hand samples suggested the erupted lava was feldspar-bearing porphyritic basalt. No lava effusion was observed, although some steam was seen at the fissure (figure 29). Figure 29. Oblique aerial photograph of Manda Hararo showing the eruptive fissure, scoria ramparts, and gas plume on 4 July 2009. Courtesy of Talfan Barnie, University of Cambridge. The fissure itself was inaccessible over land because it was surrounded by hot rock and could only be observed from a distance. Only a small part of the margins of the flow were visited on the ground due to limited time, rough terrain, and high temperature and humidity. The lava flows appeared to have cooled significantly, with the FLIR recording typical temperatures of between 30 and 120°C for the flow surfaces, and a maximum temperature of 238°C observed from the air (figure 30). The team made gas measurements at hot cracks in the flow front where they smelled volcanic gases and the FLIR registered temperatures over 100°C. According to David Ferguson, the group used FLIR thermal images to determine a safe route for walking. While the front of the lava flow had a dark black crust, similar to that of much colder flows, the FLIR camera on land recorded temperatures of up to 162°C around the cracks and fissures of the flow surface. Figure 30. FLIR image of the 4 July 2009 eruption at Manda Hararo showing temperature distribution in and around the fissure. Courtesy of Talfan Barnie, University of Cambridge. A 6 July ASTER (Advanced Spaceborne Thermal Emission and Reflection Radiometer) image from the eruption site shows a warm 6.3 x 1.4 km flow erupted from a NW-SE trending fissure (figure 31). The area of the flow field is 4.0 km2. The coordinates of the center of the flow field are 40.655, 12.256. A 9 July EO-1 ALI panchromatic image shows the flow at a higher resolution (figure 32). Figure 31. ASTER infrared image at Manda Hararo taken on 6 July 2009. The image shows a warm flow, 6.3 x 1.4 km, erupted from what looks like a NW-SE trending fissure. A clear pre-eruptive image from May 2009 shows nothing anomalous at this spot, indicating that the lava flow is new. The coordinates of the center of the flow field are 12.256°N, 40.655°E. Courtesy of Matt Patrick. Figure 32. An EO-1 ALI panchromatic image (10-m pixel size) showing the flow at Manda Hararo on 9 July 2009. Courtesy of Matt Patrick. Information Contacts: Gezahegn Yirgu, Dept of Earth Sciences, Addis Ababa University, P.O. Box 729/1033, Addis Ababa, Ethiopia; Simon Carn, Dept of Geological and Mining Engineering and Sciences, Michigan Technological Univ, 1400 Townsend Dr., Houghton, MI 49931, USA (URL: https://so2.gsfc.nasa.gov/); Afar Rift Consortium (URL: http://www.see.leeds.ac.uk/afar/); Charles Holliday, U.S. Air Force Weather Agency (AFWA)/XOGM, Offutt Air Force Base, NE 68113, USA; Hawai'i Institute of Geophysics and Planetology (HIGP) Thermal Alerts System, School of Ocean and Earth Science and Technology (SOEST), Univ. of Hawai'i, 2525 Correa Road, Honolulu, HI 96822, USA (URL: http://modis.higp.hawaii.edu/); guardian.co.uk Science Blog (URL: https://www.theguardian.com/science/blog); David Ferguson, Dept of Earth Sciences, Univ of Oxford, Parks Road, Oxford, OX1 3PR, United Kingdom; Talfan Barnie, Dept of Geography, Univ of Cambridge, Downing Place, Cambridge CB2 3EN, United Kingdom (URL: http://www.geog.cam.ac.uk/people/barnie/); Afar Rift Consortium, School of Earth and Environment, Univ of Leeds, Woodhouse Lane, Leeds, LS2 9JT, United Kingdom (URL: http://www.see.leeds.ac.uk/afar/); Matt Patrick, HIGP/SOEST, Univ of Hawaii-Manoa, 1680 East-West Road, Honolulu, HI 96822, USA. A large sulfur dioxide plume and several thermal anomalies from Manda Hararo were detected in satellite imagery during 28-30 June. Thermal anomalies detected in satellite imagery indicated a surface lava flow in the Karbahi region. Karbahi is a graben area with numerous active faults, fissures, and basalt flows, NW of the center of the broad Manda Hararo volcanic complex. Preliminary data suggested that the eruption was larger than the previous eruption in August 2007. On 8 July, a scientist that visited the area reported fresh lava flows, an eruptive fissure that was about 5 km long, and gas emitting from multiple cones. A large sulfur dioxide plume and several thermal anomalies from Manda Hararo were detected in satellite imagery on 13 August. On 16 August, a field team conducted aerial and ground observations of a locality known as Karbahi, a graben area with numerous active faults, fissures, and basalt flows, NW of the center of Manda Hararo. Observations revealed active volcanism, including isolated areas of intense gas emission and visible sulfur deposits. Basaltic lava flowed from long fissures, predominantly to the W of the graben floor. Each fissure was covered by a continuous row of small and closely spaced spatter and scoria cones 2-10 m high. Spatter and scoria deposits ranged in size from coarse lapilli to bombs. Incandescence and occasionally small flames were emitted from the tops of some of the cones. Observed 'a'a and pahoehoe flows traveled a few hundred meters from the vents. The overall thickness of the flows varied but reached several meters in places. Lava channels and lava tubes were abundant. Fault scarps with fresh breaks and rockfalls were noted. The area affected by tectonic and volcanic activity was an estimated 5-7 km long and 1 km wide. According to eye-witness accounts, a cracking sound was heard and a tremor was felt on 12 August. On 13 August, "fire" was seen that lit up a large area. "Fire and smoke" continued with variable intensity until 16 August. No damage to life or property was reported. On 13 August at 1315 a large sulfur-dioxide (SO2) cloud was detected over Ethiopia and Sudan by the Ozone Monitoring Instrument (OMI) on NASA's Aura satellite. This was presumed to be the result of a volcanic eruption in western Afar, Ethiopia, though the source was then unclear. Preliminary analysis indicated that the cloud contained ~ 8,000 tons of SO2, although a more precise estimate depends on the altitude of the cloud, which was not known. MODIS satellite imagery, interpreted at the University of Hawaii, showed the presence of a cluster of hot-spots centered at 12.25°N, 40.65°E late on 12 August, presumably corresponding to an active lava flow. The eruption site appears to lie within the Manda Hararo volcanic complex around 40 km SSE of Dabbahu volcano, which had its first historical eruption in September 2005. The massive 105-km-long, 20-30 km-wide Manda Hararo complex consists of basaltic shield volcanoes cut by regional fissures with no previously recorded historical eruptions. It is the southernmost axial range of the western Afar region. OMI data on 14 August showed continuing SO2 emissions, although by that day the extent of the MODIS thermal anomaly had diminished. Local residents reported that there had been no precursory activity of any kind during the days preceding the eruptions. The first sign of activity was noted on 12 August when a sudden heavy cracking sound was heard in the affected area. The sound was heard first in the N part and propagated continuously toward the S. Only a small ground tremor was felt at that time. At about 1730 on 13 August, "fire" started to be seen from the N in the direction of Gommoyta and continued to the N, lighting up the entire area. A curtain of "fire and smoke" rose high into the sky in the area and this activity continued with variable intensity until it subsided on the morning of 16 August. The frightened local inhabitants evacuated the area and therefore did not observe effusion of the lava flows. So far no damage to life or property has been reported. 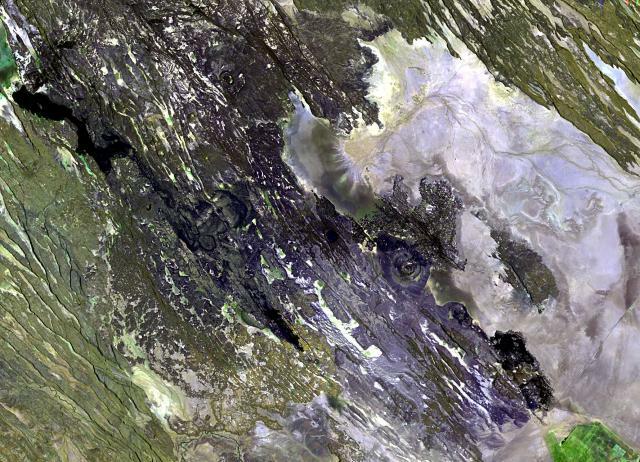 A field team was able to investigate the area of new eruptions in the Manda Hararo region on 20 August (figure 1). Karbahi is the name given to the rift's axial segment/graben, a region with numerous active normal faults, fissures, and recent basalt flows, bounded by large normal faults. Prominent features in the Karbahi graben area include Gommoyta and Diyyilu felsic volcanoes, which are found immediately to the N of this locality. Figure 1. Location of the Manda Hararo fissure eruption (round dot). Other features shown include the Gabho and Dabbahu volcanoes, and the city of Semera. Courtesy of Gezahegn Yirgu, Addis Ababa University. Aerial observations showed isolated spots where intense emission of gas (with distinct smell of sulfur dioxide) was taking place. In few places, white and yellowish deposits of sulfur were visible. Long, discontinuous fissures, arranged en echelon, from which lavas had flowed on either side, predominantly traveling W to the graben floor (figure 2). Numerous small spatter and scoria cones were aligned on the fissures. Reddish glow and rare flames were also observed on top of some of the tiny craters of these cones. Fault scarps with fresh breaks and rock falls were also visible from the air, probably showing evidence of recent movement. A narrow graben-like collapse structure oblique to one of the fissures was also observed. The segment affected by tectonic and volcanic activity was estimated (with the help of a helicopter pilot) to measure 5-7 km long and 1 km wide. Figure 2. Steam rises from new fissures that fed lava flows at Manda Hararo, as seen on 20 August 2007. Courtesy of Gezahegn Yirgu, Addis Ababa University. Ground investigations found basalt lava flows and steam emissions ongoing on 20 August. While walking on top of the lavas, scientists felt immense heat emanating from the flow surface. Each fissure was covered by a continuous row of small and closely spaced spatter and scoria cones. Many of the cones themselves had tiny pits from which both heat and gas escaped. The pits could not be entered due to the heat and high noxious gas concentrations. As seen from the air, a reddish glow and flames were seen at some distant cones. One fissure with its row of cones is oriented about N7°W to N10°W. 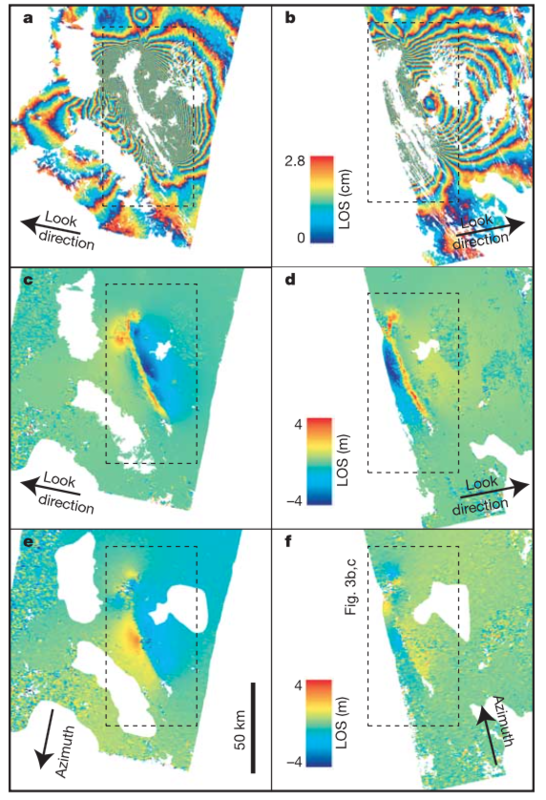 The observed aa and pahoehoe flows were relatively viscous and did not travel beyond a few hundred meters from their fissure vents (figure 3). The overall thickness of the flows was variable and reached several meters in places. Lava channels and tubes were abundant. The spatter ramparts and scoria cones varied in height from 2 to 10 m. Spatter and scoria fragments varied from coarse lapilli to bombs. The new lava was moderately porphyritic with small and sparse plagioclase phenocrysts. Field observations found that the older lavas at the site exhibited the same features. Representative lava samples were collected. Figure 3. A closer view of the August 2007 lava at Manda Hararo. The dark-colored basaltic flows display aa and pahoehoe textures. Courtesy of Gezahegn Yirgu, Addis Ababa University. Information Contacts: Gezahegn Yirgu, Atalay Ayele, Shimeles Fisseha, Tadiwos Chernet, and Ato Kifle Damtew, Department of Earth Sciences, Addis Ababa University, Addis Ababa, Ethiopia; Simon Carn, Joint Center for Earth Systems Technology (JCET), University of Maryland Baltimore County (UMBC), 1000 Hilltop Circle, Baltimore, MD 21250, USA (URL: https://so2.gsfc.nasa.gov/); Hawai'i Institute of Geophysics and Planetology (HIGP) Thermal Alerts System, School of Ocean and Earth Science and Technology (SOEST), Univ. of Hawai'i, 2525 Correa Road, Honolulu, HI 96822, USA (URL: http://modis.higp.hawaii.edu/). As the southernmost axial range of western Afar, the Manda Hararo complex is located in the Kalo plain, SSE of Dabbahu volcano. The massive 105-km-long and 20-30 km wide complex represents an uplifted segment of a mid-ocean ridge spreading center. A small basaltic shield volcano is located at the N end of the complex, S of which is an area of abundant fissure-fed lava flows. Two basaltic shield volcanoes, the larger of which is Unda Hararo, occupy the center of the complex. The dominant Gumatmali-Gablaytu fissure system lies to the S. Voluminous fluid lava flows issued from these NNW-trending fissures, and solidified lava lakes occupy two large craters. The small Gablaytu shield volcano forms the SE-most end of the complex. Lava flows from Gablaytu and from Manda overlie 8,000-year-old sediments. Hot springs and fumaroles occur around Daorre lake. The first historical eruptions produced fissure-fed lava flows in 2007 and 2009. Varet J, 1978. Geology of central and southern Afar (Ethiopia and Djibouti Republic). CNRS, Paris, 124 p.
Satellite radar data spanning the 2005 Dabbahu rifting event produced using data from ESA?s Envisat satellite. Left column (a, c, e) from descending track 49 using images acquired on 6 May and 28 October 2005, IS2 beam mode; right column (b, d, f) from ascending track 29 images on 28 July 2005 and 26 October 2005. a, b, Wrapped interferograms; c, d, range change (unwrapped interferogram where available, range offsets elsewhere); e, f, azimuth offsets. LOS, satellite line of sight. Dashed boxes enclose area shown in Fig. 3. All SAR data copyright ESA. From: Wright et al. 2006. Reference List: Wright et al. 2006. Wright, T. J., C. Ebinger, J. Biggs, A. Ayele, G. Yirgu, D. Keir, and D. A. Stork, 2006. Magma-maintained rift segmentation at continental rupture in the 2005 Afar dyking episode. Nature, 442, 291-294. Remarks: Following the large dyke intrusion of September 2005, there were 13 smaller intrusions from June 2006 to Jun 2009. Deformation from these intrusions is modeled by various authors as planar dislocations. Inter-dyking deformation is also modeled. Reference List: Hamling et al. 2009; Hamling et al. 2010; Grandin et al. 2010a; Grandin et al. 2010b; Field et al. 2012; Hamling et al. 2014. Field, L., Blundy, J., Brooker, R. A., Wright, T., & Yirgu, G., 2012. Magma storage conditions beneath Dabbahu Volcano (Ethiopia) constrained by petrology, seismicity and satellite geodesy. Bulletin of Volcanology, 74(5), 981-1004. Hamling, I. J., Wright, T. J., Calais, E., Bennati, L., & Lewi, E., 2010. Stress transfer between thirteen successive dyke intrusions in Ethiopia. Nature Geoscience, 3: 713-717. Hamling, I.J., Ayele, A., Bennati, L., Calais, E., Ebinger, C.J., Keir, D., Lewi, E., Wright, T.J. and Yirgu, G.,, 2009. Geodetic observations of the ongoing Dabbahu rifting episode: new dyke intrusions in 2006 and 2007. Geophysical Journal International, 178(2), pp.989-1003. The Manda Hararo complex, which extends diagonally from the NW to SE across this Landsat image, represents an uplifted segment of a mid-ocean ridge spreading center. The massive complex is 105 km long and 20-30 km wide, and consists of small basaltic shield volcanoes and abundant fissure-fed lava flows. The dominant part of the complex lies to the south, where the Gumatmali-Gablaytu fissure system is located. Steam rises from new fissures that fed lava flows at the Manda Hararo complex, as seen on August 20, 2007. The Manda Hararo complex is the southernmost axial range of western Afar. The massive complex is 105 km long and 20-30 km wide, and represents an uplifted segment of a mid-ocean ridge spreading center. Voluminous fluid lava flows issued from NNW-trending fissures of the Ethiopian rift. Photo courtesy of Gezahegn Yirgu, 2007 (Addis Ababa University). Dark-colored basaltic lava flows erupted from the Manda Hararo complex are seen here on August 20, about a week after the start of the eruption, the first historical eruption of Manda Hararo. 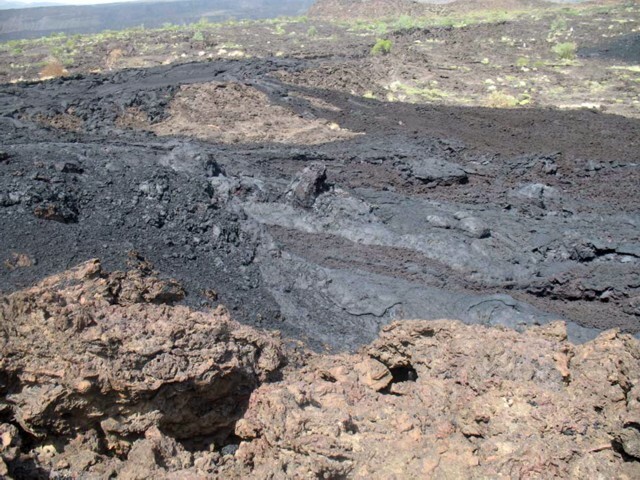 The aa and pahoehoe lava flows, traveled only a few hundred meters from a fissure lined with small spatter ramparts and scoria cones. There are no samples for Manda Hararo in the Smithsonian's NMNH Department of Mineral Sciences Rock and Ore collection. Large Eruptions of Manda Hararo Information about large Quaternary eruptions (VEI >= 4) is cataloged in the Large Magnitude Explosive Volcanic Eruptions (LaMEVE) database of the Volcano Global Risk Identification and Analysis Project (VOGRIPA).